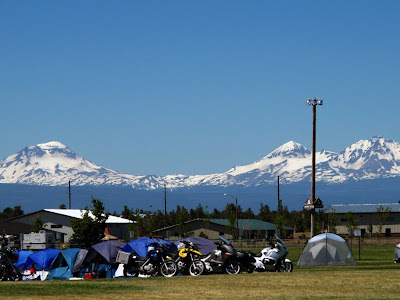 July 15 was the first official day of the BMW Motorcycle Owners Association Rally 2010. 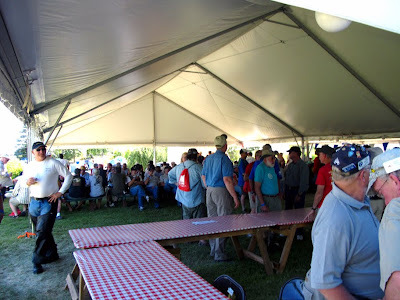 The rally is an excuse for a whole bunch of BMW Motorcycle owners to get together and tell tall tales to each other, drink beer, go to educational seminars, drink beer, talk to vendors who make stuff for BMWs, drink beer and go on rides (no beer drinking). It’s a lot like the RSNA, but in the Summer and lots of attendees camp at the rally site (no camping at McCormick that I'm aware of). Actually, camping is kind of a tradition for many attendees (not me – I like a bed and shower). I went to a few seminars to try to get educated motorcycle stuff – both related to and not related to BMWs. This worked to a certain degree. In between getting educated I looked up some vendors who I wanted to talk to about import things like; improving lighting, picking up some additional cool bungee straps, radar detectors and other odds and ends if I passed by an interesting vendor. Oh, then I had a beer. I ran into Tom and Jim a couple of times and sat in the shade to exchange stories about what they got educated on and so forth. By the way, did I mention it was hot? I didn’t have any idea Central Oregon could get so hot – mid to high 80s. At least there was a breeze to keep things somewhat bearable. So that’s about it for today. More rally tomorrow.